Human being are incredibly diverse both in outlook and structure with no two being exactly the same. So there are some who like nothing more than to let fate take control of their lives and see where it takes them. Then there are those who like a little structure and if this applies to you then you are in luck. Because now you will no longer need to decide which mug to use for your daily cuppa - instead it will simply be a case of using the mug related to the day of the week. Essentially it takes the hassle of decision making and throwing it is the waste paper bin. Bet you wish life is general could be so easy huh? Well this is a start. 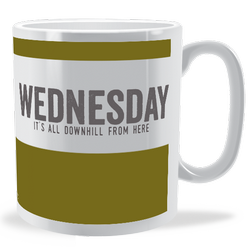 All the days of the week mugs come in 8 different colours and all day related sub-text along with the day of the week. 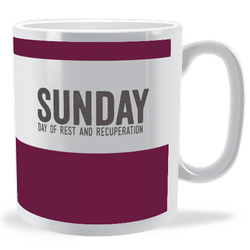 Great for the office as well as for home so make sure you get the full set - even Monday.